Etymology: from Japanese Gin Yyo, diverted from Chinese Ya Tchio, "duck leg" (form of its leaf), or perhaps from Chinese word yin kuo, "silver fruit" (clear fruit). Biloba recalls the form "with two lobes" of the leaf. It was nicknamed"tree of 40 ecus", because a young plant was bought for 40 ecus, in 1788, important sum for epoch, by a botanist of Montpellier, Mr de Pétigny, from an English botanist. Origin: China. The Ginkgo is the oldest admitted tree : it exists since 200 million years (one says that it is a "living fossil", alone witness of very remote epoch). Unknown in the Western world, it was " discovered " in Japan, by 1700, by Engelbert Kaempfer, doctor of the Company of Dutch India. Planted for the first time in Europe in Utrecht in 1730, then in Kew Gardens, in 1754. Pyramidal Form. Its branches with sparse foliage leave the trunk at right angle. Its leaf is primitive, without central vein, in the form of fan (" of duck leg "). It turns to yellow in autumn. Its reproduction is also primitive. 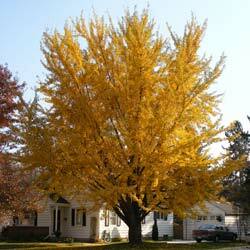 The Ginkgo is part of the class of Gymnospermes, as conifers, appeared the first on earth: the seed is not protected by an ovary. But in the Ginkgo, the egg grows naked before, to reach a ball shape (which could be be taken for a fruit). Sperm from different feet (dioecious species) are transported by a liquid pollen to the egg cell which recalls the ancient pollination of the fern. The seedling develops immediately after germinationwithout passing through the stage of the seed. Uses: - Medicine: Chinese medicine has identified a long extract from the leaves to stimulate blood circulation and lungs, and effective against asthma. Action still controversial on cognitive impairment (almond leaf). In 1578, the Ming Dynasty, Li Schizen, Chinese doctor, herbalist and naturalist, published his monumental work, a veritable encyclopedia of natural medicines, the Bencao Gangmu. It describes the use of leaves of Ginkgo and almonds. This book was translated into Japanese in 1607, and published in the eighteenth century, French English, German and Russian. Using ginkgo biloba for memory is the most common health benefit that users seek. - Food: very popular in Asia the kernel of the egg dyed in red is called the fruit of bliss and is available at the births and marriages (boiled or roasted almonds). - Soap: milled whole egg was used to wash and degrease clothing. - Wood: firewood, woodwork, bushel, sculptures cabinet (traditionally, it was used to make altars in temples and tables for the court hearing, according to the quality of the month).